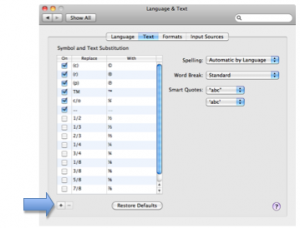 The text substitution feature of Mac OS X is intended to make it easier to type symbols (such as the copyright and trademark symbols) and fractions. However, you can use this feature to create a shortcut for any text you type on a regular basis. Choose Apple, System Preferences, Language and Text. Select the Add (+) button in the lower left corner of the window, then enter your shortcut and the desired replacement text in each field. To test out your shortcut, open Pages, TextEditor or any word processing program and type your shortcut. When you press the Space Bar, your shortcut should be replaced with the full text you entered in the Language and Text preferences.